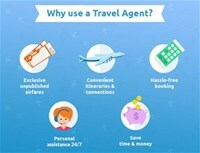 At Flair Travel Planners we are here to provide you with personal attention; we will give you recommendations based on our professional travel experience and customize a vacation package that’s just right for you! We have access to last minute specials, airline seat sales and through our affiliation with Travelsavers Canada often have promotions on tours, packages and cruises. From family holidays,destination weddings & honeymoons, complex around the world itineraries to corporate travel and protecting your trip with travel insurance...we do it all. We'll be there for your entire journey, from departure to return.